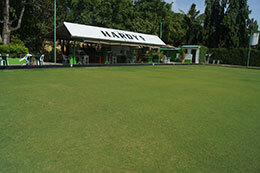 Nomad's Sports Club was the first to introduce lawn bowling into the Philippines. 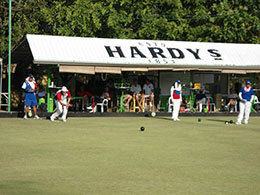 Nomad's is a member of the Philippine Lawn Bowling Association (PLBA) which is recognized by the Philippine Olympic Committee and the Philippine Sports Commission. 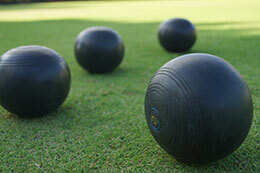 The PLBA is also a member of the World Bowls Council. In the past, Nomad's have hosted clubs from Hong Kong, Calcutta and Australia in social challenges. The section also hosts Philippine clubs, Hidden Vale, from Angeles City / Coconut Grove from La Union and Cebu Short Mat club from Cebu in allocated National title championships, as well as visiting them for both National Titles and social games. Nomad's members have achieved a good deal of international success with several members being selected to play for the Philippine National Team. Ellen Atkins / Nancy Breckenridge / Brent Chamberlain / Damien Allison have all represented the Philippines in international competitions and our green keeper Emman Portacio is a regular current member of the National team. Considering the smaller size of the Nomad's bowls section, we have also had a good deal of success at the National Championships with club members regularly winning medals, even though we are playing against the National team members who train on a full time basis. The club plays social bowls every Saturday and Sunday afternoons, generally from 2:30 p.m (weather permitting) Anyone is permitted to join with club members to play a social game on these days, or if you are just interested in 'having a go' to see what the game is like, you are more than welcome to try. The club has many sets of bowls available for use, just ask our green keeper Emman or any of the other members that you see. Emman or any of the other members are always willing to give coaching to help get you started as well, or if you would like some more advanced coaching, you just need to ask. All games are of mixed sexes, including club championships. Every year a competition is held for club members to find the club champions in singles, doubles, triples and fours. Other competitions organized throughout the year are the Mini-World Cup, where members play for the country of their birth, Presidents Cup (Fours), Festo Cup (Pairs), Hangover Cup (for anyone who can still stand up on New Years day). Other events involving the other Nomad's sections are also organized during the year. As Filipinos appear to have a natural talent for the sport, the Bowls Section is keen to encourage all to take up the sport. Bowls is a sport that can be played for your whole life, players being from under 12 years to over 80, yet it is one sport that currently, it is within the realms of possibility for any Filipino to quickly attain international standard. Congratulations to Philippine National Players Christopher Dagpin, Men’s Quarter Finalist, and Sonia Bruce who made it to the finals picking up a silver medal in the Singles at the Hong Kong Classic last weekend. Moving onto the Hong Classic Pairs, both the Philippine Men’s and Ladies teams finished 1st in the group and went on to have wins in their semi final matches, The men against One Oasis and the Ladies defeated England. They were both up against Australia in the finals and the both won their matches to pick up the gold medals. Congratulations to Our Men’s Champions Christopher Dagpin & Angelo Morales and our Ladies Champions Sonia Bruce & Ainie Knight. Well Done!!! Nomad Club singles will be held November 22 / 23. Nomad Club pairs will be held November 29 / 30. Nomad Presidents Cup fours will be held December 14. Philippine National Fours Championships Jan 9 / 10 / 11. (Angeles City).